Sheldon Adelson, 82, is grateful to the MSAR because he understands that his license to operate here is “a privilege.” That is why he also plays along with the cap on tables: “As long as everybody is being treated fairly.” We met Mr Adelson for an exclusive interview at a presidential suite on the 37th floor of St Regis Macao a few hours after he optimistically forecast that Macau gaming revenues are at, or close to, the end of a steep decline. The topic would dominate our discussion with one of the 20 richest individuals in the world. “I think we’re reaching the bottom right now. If we haven’t already reached the bottom, it will reach the bottom in a short time.” Why, we asked. 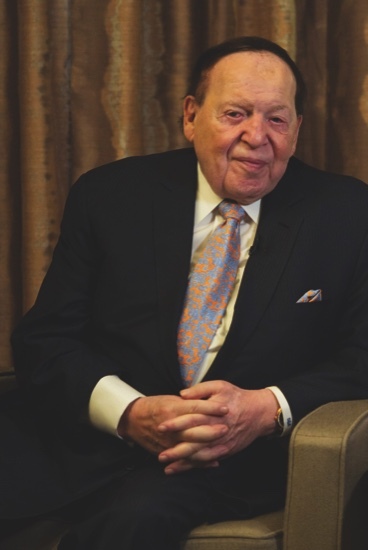 Adelson, the visionary, the tough businessman, the intrepid investor, the fearless boss, was in a cheerful mood the day he opened his most recent addition to the interconnected Sands China properties network on the Cotai Strip – St Regis, his place of choice when in NYC. The LVS grand plan for Cotai is coming closer to completion. When The Parisian Macao is completed “in 8 to 10 months,” Sands China will have almost 13,000 hotel rooms in four interconnected resorts and over 1,000 retail stores. “Where can you find 1,000 retail stores? There’re no shopping malls like that anywhere else in the world,” Adelson said. Last year, 31 million people visited Macau and 62 million visited Sands properties. 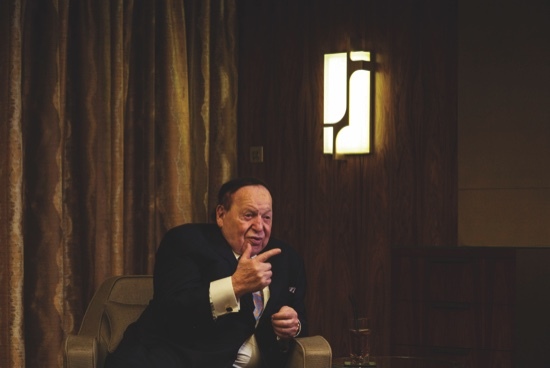 “Mathematically each person that visited Macau visited 2 of our properties,” Sheldon Adelson said last Friday. Macau Daily Times – Macau gaming has only just tapped the huge Chinese market. Most of the gamblers are from the Guangdong province. Do you plan to expand the inbound markets from China and other countries? Sheldon Adelson (SA) – Well, we cannot promote in China. So we can’t take steps specifically to bring in more Chinese. We have different events at the arena – at the 15,000 seat Cotai Arena – that’s able to be transmitted throughout China and so, there is some indirect promotion of Macau. Years ago, when I first opened the Venetian, the government said: no communication, you can’t promote Macau at all. So we get the attendance by word of mouth and by the IVS (the individual visa scheme) and beyond that, we’re promoting in different countries in the Pacific region – Korea, Japan, Vietnam, Thailand, India, Malaysia, Indonesia… But Malaysia and Indonesia are very close to Singapore and they go to our properties there (Marina Bay Sands). We have what is arguably the most beautiful building in the world, in Singapore. SA – I don’t think there will ever be gaming [in mainland China]. SA – Taiwan is [still] possible and that’s one of the places where we promote Macau. MDT – Also, you showed interest in the operations in Japan and Korea. Are you still interested? SA – We’re still very interested … It’s not going to compete with Macau. MDT – They have their own markets, I believe. SA – They have their own markets. And even some of the northern Chinese areas, I mean north of Beijing, Harbin, Dalian, Shenyang, maybe those places will send some people into Korea and Japan, if Korea and Japan legalize gaming [for locals]. We don’t want to go to Japan and Korea with foreigners-only casinos – that’s not our business model. MDT – Coming back to Macau, the smoking ban, the smoking law, the cap on tables. How can you manage these with the new properties coming? SA – As long as everybody is being treated fairly. I can manage with the 250 tables, although I have a letter guaranteeing me what tables I needed and I applied for 450, but I can live with what everybody else is living with. My gaming license is a privilege, it’s not a right. So if what they’re saying to me is, “We’re only going to give everybody 250 tables.” How can they give me more? They said the concessionaires that build more non-gaming components should get more. I built more non-gaming components from the beginning with the Venetian: that’s why it’s still a must see property. MDT – In the press conference [last Friday], you put a lot of emphasis on the development and the completion of the Y-Bridge. You think that will be a game changer? SA – Big [game changer]. MDT – It was announced that it’s delayed for a year. MDT – Some people in Macau are happy with that because the infrastructure in Macau is not ready to have all those people coming over. SA – You can’t have everything. You can’t have raised salaries, promotion opportunities, new professions and not have the crowd. You don’t want the crowd, but you want all the other stuff. You can’t have the economic development without the crowds. It’s like a restaurant. There’s a joke in the States that says, “Oh, nobody goes to that restaurant anymore, it’s too crowded.” You can’t have benefits without the cost. The benefits that we get – an improved economy, raised salaries…. When I first came here in 2001, the average salary was MOP4,000 a month. Today it’s MOP200,000 a year. It’s a lot more than MOP4,000 a month, four times that. MDT – Of course, there was some cost to that, there was rampant inflation, especially in the housing sector. SA – If you ask the guys who own the house and the house went from USD150 a foot to $500 a foot and they could sell it, they’re very happy, but inflation is a component of economics, it’s inescapable. If you have a good economy, you can have more inflation. You have a bad economy, you have less inflation, there’s less demand. With the Federal Reserve, which is the ultimate financial authority in the United States government, it’s looking to have 2% inflation, we don’t even have 2%. So the Federal Reserve is trying to increase the inflation rate. MDT – Speaking about the United States, it’s all over the news: you started very early in your life selling newspapers, now you’re buying them. SA – [Laughs] Not buying them, I just bought one. I didn’t buy it. MDT – …you and your family. SA – You know what I say when everybody says, “The family. Oh, you’re the family?” Really, do you have grown children? [Yes] Can you tell them what kind of car to buy? [No] Can you tell them what clothes to wear? [No]. Right. Can you tell them what kind of house to live in? No. You don’t tell your children what to do, I can’t tell my children what to do. They wanted to buy the newspaper so, they bought the newspaper. I don’t have anything to do with it, I have no financial interest. My money that the children have with which to buy the newspaper is their inheritance. I don’t want to spend money on a newspaper. MDT – So you don’t have any media investment strategy for greater China? SA – No, no. We have a newspaper in Israel and it’s the most widely read newspaper. It’s called ‘Israel Today’ in English. In the local language, in Hebrew, it’s called the ‘Israel Hayom’. I started that because the newspaper there was so far to the left politically that it was misleading the public and I had a meeting with the owner and he said he didn’t want me to be a competitor. I said, “Well, just go to the centre politically,” he said, “I’m already to the right.” I said, “No you’re not, you’re to the left.” So anyway, I set it up and my basic business model was to give it out free and survive on advertising, which is what I’m doing. I bought a printing plant. I buy my paper and newsprint and I print my own newspapers. I’ve got [hundreds] employees, but you know how often I talk to the editor? Just when I go there about four times a year. I never call them. … The Review Journal in Vegas makes money and the children can’t make much money when interest rates are at zero. We don’t like to take…, the whole family doesn’t like to take big risks. They feel that there’s a lot of history of profitability and we kept the operation in the hands of the [previous] owners. We’re not operating it. So I’ll probably never talk to the editor. MDT – Some see your involvement, or your family involvement, as a political play, given your great influence in politics in America. SA – That’s one of my careers. (Smiles) So they see, but what can I do? The Review Journal newspaper is already to the right. So how much more can I bring it to the right? It’s already there. MDT – So editors and journalists can operate [independently]? SA – [They can] Operate by themselves. We have about 200 journalists at the Israel Today newspaper. You could call any one of them and you say, “Did anybody from the Adelson family ever tell you what to write or what not to write?” and they will tell you, “No.” If somebody’s going to write something bad about me and [even if] there’s no justification for it, I won’t know about it until after it’s done.